As the countless gallery shows and satellite events put out their best in conjunction with the fourteenth edition of Art Basel Miami Beach, local favorite creative platform Primary, has made sure to set itself apart from the pack with its newest exhibition. In an unprecedented partnership between the cultural placemaker Goldman Properties, Primary presented a solo show by Magnus Sodamin at the globally recognized Wynwood Walls. “Calm Before the Sun”, referring to the tranquility before a sunrise as seen from the water, remarks on Sodamin’s attention towards the passage of time, the natural environment of South Florida, and how it affects our moods or visual perceptions. These themes, along with Sodamin’s signature abstract imagery of light, space, time, flora, and fauna take the shape of intimate round and rectangular canvases of varying size, that hang from the galleries trusses. 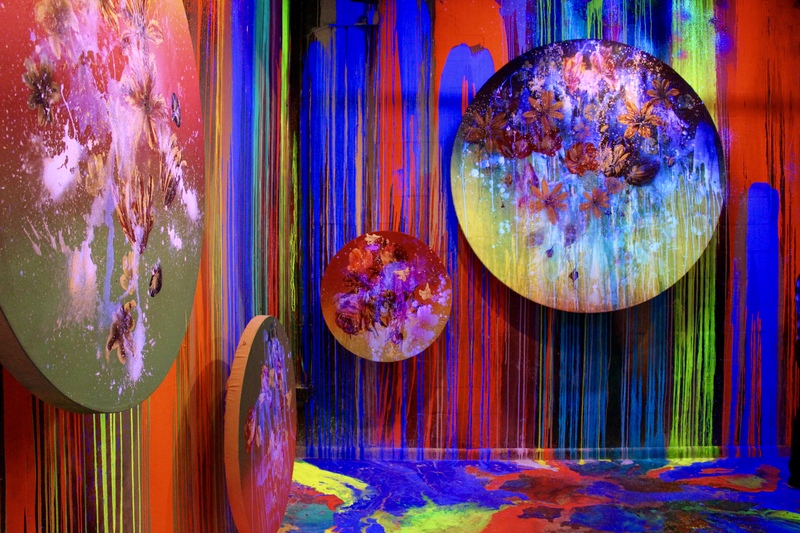 In addition to the floating pieces, the Manhattan-born, Miami-based artist wasted no surface, painting the entire gallery from wall to wall, floor to ceiling with drips, swirls, and splats of different colors, providing a complementary background to the bright pieces. Finally, the installation is accented by black and fluorescent lights that continuously interchange, producing different moods and visual perceptions of the immersive installation. The combination of all these components create what seem as an alternative environment of portals floating in space and time. In all, the installation marks Sodamin’s second successful solo show of 2015, an impressive run for the artist, allowing him to expand his trademark imagery and broaden his viewership. While accompanied by all the international artists inside the Wynwood Walls, Sodamin created forceful centerpiece that not only shows his equal prowess among the world’s best, but Miami’s home growth as an art powerhouse on the national and international circuits.